Our mission has just won its twelfth Gabriel Radio Station of the Year Award! We share this tremendous honor with you. Please pat yourself on the back! We remain the only small station to ever receive this accolade. October 22nd, program director Ric Schmidt will accept the Gabriel on your behalf and ours, at the awards ceremony in Los Angeles. HEARING VOICES (left): That’s what KNOM listeners will be doing. In this case, it will be the voice of Vince Pikonganna (pronounced pikk-ah-WAH-nah), recorded here in Studio C by public affairs director Amy Flaherty. In each “Elder Voices” program, seniors talk about what they consider important. There is great concern that knowledge of traditional customs and wisdom may be eroding, and in some cases, lost, and this program is one of KNOM’s attempts to help preserve them. The soft-spoken Vince was born on rugged King Island, 55 miles northwest of Nome, a stone’s throw from the Bering Strait. His family maintained a traditional subsistence lifestyle on the steep and rocky island, surviving from walrus, polar bears, seals, sea birds and their eggs, fish, crabs and tundra greens, until he was twelve years old. At that time the Bureau of Indian Affairs closed the village school, forcing the King Island community to move to Nome. King Island was named in 1778 by Captain James Cook for one of his shipmates, Lt. James King. In 1937, “glacier priest” Fr. Bernard Hubbard, SJ and his crew brought a life-size bronze statue of Christ the King, which was hoisted 700 feet above the village to the top of the island and blessed. Vince’s shirt reads “Inupiaq (in-OO-pee-ak) Values.” Among them are humor, respect for others, sharing, and love for children. HAT’S OFF to KNOM volunteer production director Liz Recchia (left). The Public Relations Students Society of America is honoring Liz with their National Golden Key Award. Among requirements for the accolade are high college grades and demonstrating leadership. Fewer than thirty young people are given this honor each year. Congratulations, Liz! We’re proud of you! NOT A MOOSE-TAKE: Recently, fish and game officials asked KNOM to announce that a female moose had been spotted a few miles from Nome, sporting antlers and caring for a calf. The announcement urged hunters not to shoot the moose, as the calf is too young to fend for itself. TO A HIGH DEGREE: In September, the National Weather Service confirmed what most of us thought: this past summer was Nome’s warmest on record. In 2004, the mercury topped 60� on 47 days, more than twice the average. It climbed above 70� on 11 days. (The average is 4.) And it boiled to 80� and above three days this summer. The average number of summer days when Nome reaches 80�? Zero days. June 7, 2004, peaking at 83�, was Nome’s sixth warmest day in 97 years of recordkeeping. What does this say about the approaching winter? Forecasters say there’s no telling. WE HAVE ISSUES! Recently, KNOM’ers Paul Korchin, Amy Flaherty, Clinton White, Jenny Holtorf and Katie Ringenbach have been busy. Among topics they’ve researched: the National Park Service Junior Ranger Program, environmental village cleanups, healthy life styles for youth, Coast Guard activities in Alaska, and the migration of the spruce bark beetle. Thank you for helping them keep western Alaska informed! Please consider adding missions like KNOM to your will. For many of us, it is the largest gift we will ever make. With prayer, we place all bequests into funds that provide for major improvements and protect the mission from unforeseen emergencies. INSPIRATIONAL SPOT: Wealth consists not in great possessions, but in having few wants. 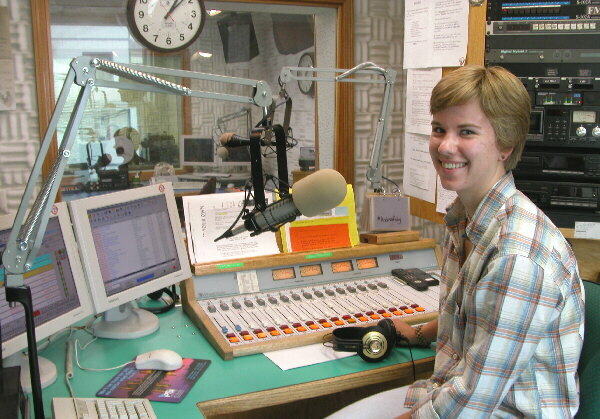 Meet new KNOM’er JENNY HOLTORF (left, announcing from Studio A). 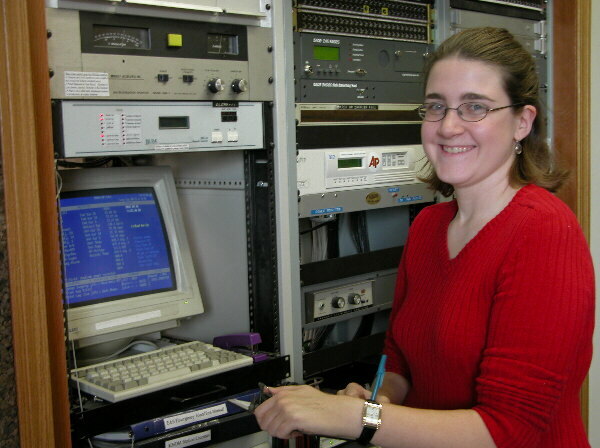 A volunteer news reporter, Jenny is a 2004 graduate of the College of St. Benedict, with a degree in English and a minor in environmental studies. She hails from Hordville, Nebraska. Jenny had a college friend from Nome, and when she saw that KNOM would be represented at the St. Benedict post-graduate volunteer fair last year, she thought "that's got to take the cake." In her spare time Jenny says "I try to stay physically active, with running and a lot of exercise." She is the 292rd person to volunteer for the mission since it was established in 1966. WHERE THERE’S SMOKE…there’s KNOM volunteer Anna Dummer, who has just hitched up with the Nome Volunteer Fire Department. She’s the first KNOM’er to don a firefighter’s helmet since KNOM volunteer maintenance chief Peter Fricilone served in 1978. BOOK ‘EM! KNOM general manager Tom Busch has been working on the history of the station for several years, and hopes to publish it in book form in January 2005. The work will include many historic photographs and inspirational spots, a complete list of KNOM volunteers since 1966 and a detailed personal account of the difficulties of construction. LIGHT TOPIC: At the end of September, we were losing 47 minutes of daylight a week! By the shortest day in December, we’ll experience just 3 hours 54 minutes of sunlight. Did you know that KNOM's web site includes an index of every Nome Static photograph since May 1997? INSPIRATIONAL SPOT: I watch a stonecutter put hammer to chisel and strike the stone one hundred times. The stone breaks on the one hundred-first blow. Yet I know that it was not the one hundred-first blow which produced the break, but the one hundred which preceded it. 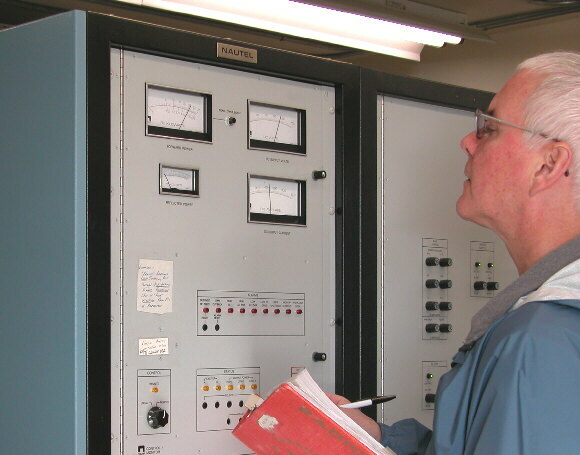 SHIP-SHAPE (left): At KNOM’s remote site, Tom Busch records meter indications on the 25,000-Watt AM transmitter and calibrates the equipment that relays these readings to the studio. It’s a weekly task. With the departure of Les Brown, Tom reassumed the job of chief engineer this spring. A licensed broadcast engineer since 1969, he also serves as KNOM general manager and development director. SPEAKING OF LES: Having retired from KNOM twice, Les Brown was back in Nome in September on a recreational moose hunting trip. Of course, Les also spent time helping the radio station. On this visit, he conducted KNOM’s quarterly tower inspection. Thanks, Les! THIRTY YEARS AGO: October 1974 brought breathtaking northern lights throughout Alaska. It was a rough month for KNOM’s equipment, as the electrical generator at the transmitter site shut down several times. Because of what would happen the next month, it’s fortunate that the crew returned the generator to good health. STAR-STRUCK: Now that we have dark hours (and very soon very many of them!) it’s a treat to see the stars again. Thank you, Lord! KNOM is a powerful award-winning radio station that beams God’s Love throughout 100,000 square miles of western Alaska, as well as into the Russian Far East. Owned by the Catholic Diocese of Fairbanks, KNOM broadcasts education, inspiration, news, companionship and positive entertainment into remote Eskimo and Athabascan Indian villages. Our only source of income is the kindness of good people like you. Once again, we thank you most sincerely for your support for our important work, and for your prayers. We remember you in prayer at each weekly staff meeting, and in our personal prayers, as well. INSPIRATIONAL SPOT: Trust the past to God's Mercy, the present to God's Love, and the future to God's Providence.